The perfect pairing for Napa reds: Cole’s Chop House. 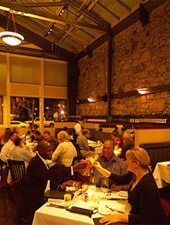 : With all the Cab in Napa, Cole’s Chop House is a well-suited accoutrement. It’s the south Napa Valley choice for a serious beef fix: Midwestern, corn-fed, dry-aged, Prime. Rest assured that Cole’s will expertly handle whatever cut you fancy, from porterhouse to filet; we like the New York strip. Just-right seasoning plus doneness that reliably matches the guideline definitions let the meat shine. Chops include beef, lamb and pork. The stray piscivore in this meat-happy hall will find solace in salmon or a special catch of the day. Traditional starters include rock-solid oysters Rockefeller or a cooling Caesar with a sprawled-out anchovy riding high. Go crisp with sides such as dark hash browns or a pile of skinny onion rings. Some accompaniments fizzle: runny seafood bisque and creamed spinach that tastes bland and comes overly-sapped in sauce. Recover with desserts such as flourless chocolate cake topped with fresh raspberries or vanilla bean crème brûlée. The dining room with loft and open kitchen has a West Coast, unpretentious feel. Consider sassy cocktails at the bar before perusing the extensive Napa Cab-dominant wine list split into appellations.